KNRUHS PG Dental Course Admissions Provisional Merit List based on NEET MDS 2019: Dr NTRUHS issued the NTRUHS PG Dental Course Course Admissions 2019 notification and Application forms through online were invited from the candidates who qualified MBBS and secured the following cutoff scores in NEET MDS 2019 and fulfilled other eligibility criteria given below for admission into the State Quota seats of Post Graduate Courses 2019 available under Competent Authority Quota in the Government and Private un-aided Dental Colleges affiliated to Dr.NTR UHS and PG Dental Course courses in Sri Venkateswara Institute of Medical Sciences, Tirupati (SVIMS), Tirupati. State Merit position of the applied candidates has been prepared based on NEET MDS 2019 Score and KNRUHS will publish the Provisional Merit list based on NEET MDS 2019 Ranks. Candidates who were applied for this courses they can check their names in the merit list. 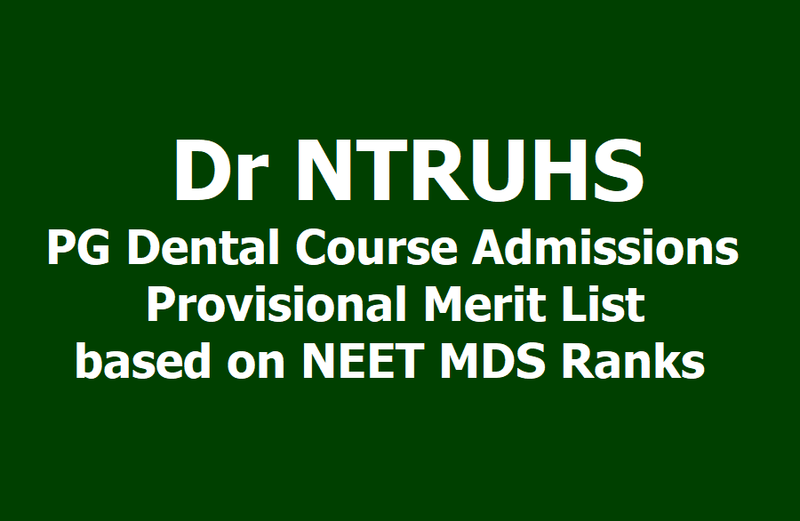 NTRUHS has notified that the web based counseling will be conducted for admissions into Post Graduate Dental Courses for competent authority quota in colleges affiliated to NTR UHS and PG Dental Courses for the academic year 2019-20. All the candidates who have applied from 25-03-2019 to 30-03-2019 for admission into PG Dental courses Under Competent Authority Quota of Dr.NTR UHS for the academic year 2019-20 are here by informed that the verification of Original certificates will be held from 09.00 AM on ..... at the centers to be notified. Day wise separate schedule will be displayed in the University Website along with list of applied candidates. Further, candidates are informed to follow University Website: http://ntruhs.ap.nic.in regularly for further latest updates regarding counseling process. Candidates who have applied online in response to NTRUHS notification and whose names figure in the Provisional Merit list of PG Dental course admissions has been displayed on 31-03-2019 in the Website of NTR UHS are informed to attend for FIRST AND FINAL verification of their original certificates as per the schedule given below. Candidates have to attend in person along with print-out of their application form duly signed and two sets of self attested xerox copies. After verification of original certificates, the final merit Position of the candidates will be determined and notified so that the candidates in the final Merit list can exercise web options for Post-Graduate Dental Courses as the case may be as per the schedule to be notified separately.